If your Jeep is equipped with large rims with thin spokes, brake calipers are often exposed. They are often covered with dust and don't always look good. 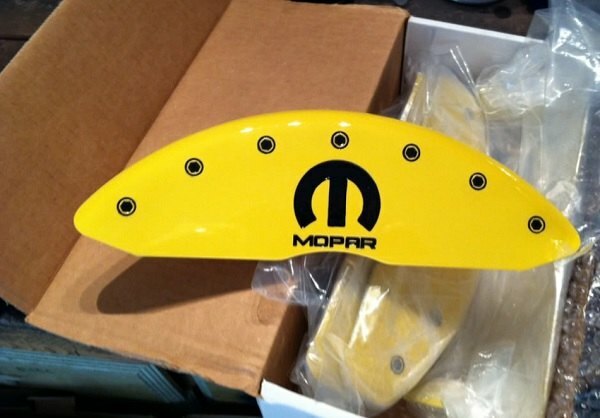 MGP caliper covers are designed to dress up your brakes a little and give them a custom touch. The covers are made of the highest grade aluminum and designed to perform better than your stock ones. Not long time ago the MGP company renew their lineup of custom caliper covers and now they are available for your 2015 Renegade as well. MGP caliper covers are available in multiple colors, and they can even make them the same shade as the paint on your Jeep if you supply the paint code. Which ones would you choose for your Jeep? I was thinking the same thing... darn. I like the way my calipers look when they are rusty and dirty. I saw these on a Durango and they looked hilarious! The covers are made of the highest grade aluminum and designed to perform better than your stock ones. There are stock caliper covers? There are no caliper covers stock. Personally, the factory treatment on the calipers looks better than that crap they are trying to sell. I also don't trust anybody who is selling when they have that many grammatical errors. I hadn't really noticed the factory treatment until I saw your post, and then I had to go look. I actually like the look of the ones CARiD is selling. Of course that doesn't mean I'm going to make a purchase. It's just my observation, and in my opinion the factory treatment is a sickly looking gray. Very few things you can add to your car are as non-functional and scream "poser" as caliper covers...except maybe those stick on exhaust portholes they sell at Pep Boys. Starting to think what it will look like with "Renegade" in place of where Mopar is, might be what gives it even more of an OEM touch.